Is Roy Greenslade’s Despair Justified? So, that’s it then – the game’s up. Roy Greenslade’s bleak analysis would have us believe that the good ship “Labour and the Left” has at last run aground and is unlikely to be re-floated. No one doubts that the Labour Party is going through one of its periodic spasms of internecine conflict and less than promising electoral prospects. But it would be a serious mistake and an unnecessarily self-inflicted wound to throw in the towel, just because the party’s leaders – over three or more decades – have made a hash of providing Labour supporters with a coherent and convincing way forward. It is not as though there is not a perfectly sensible path to rebirth and salvation. The question to be answered is not whether or not it exists but as to why it has not been taken. Labour’s current difficulties are the direct and inevitable outcome of intellectual failure. That failure originated in the 1970s, with the apparent demise of Keynesianism, and gathered pace with the neo-liberal revolution that swept much of the western world in the 1980s. Many Labour politicians and thinkers will resist the notion that their own thinking has been influenced by those developments. They will protest that they remain committed to the true faith. They will point to their continued allegiance to the great left virtues – social justice, equal treatment, solidarity, tolerance and compassion. All well and good. But where they have failed is that, having proclaimed those values, they have signally failed to explain how they are to be achieved. And that is because they have been unable to provide an analysis of how the economy works, or of how it could be made to work, in such a way as to make those outcomes possible. The voters have accordingly remained unconvinced. How they ask, can we believe that different results will be obtained if the analysis remains the same? The truth is, in other words, that from Denis Healey onwards, most Labour leaders have lacked the intellectual firepower to challenge the basic rules of a supposedly “free market” economy – that the market can safely be left unregulated, that the economy must be run as though it is a business, that government should not second-guess market outcomes. This tacit acceptance of these supposed truths as to how a market economy should work has placed a powerful weapon in the hands of the left’s opponents. Any proposal from the left falls to be judged according to precepts asserted by those who benefit most from them to be objectively unchallengeable. The left’s leaders, rather than risk being pilloried, were easily persuaded that it was safer not to stray too far from orthodoxy. Some went so far as to make a virtue of their willingness to endorse the positions prescribed by their supposed opponents. With no effective challenge to that orthodoxy, the political battlefield was successfully narrowed to comprise only the terrain most helpful to the left’s opponents. A further tactical withdrawal was also apparently required and duly delivered. For those left politicians still ready to assert their commitment to fairness and compassion, and their concern about growing poverty and inequality, it was increasingly made clear and accepted that a choice had to be made between economic efficiency and success on the one hand and the “pie-in-the-sky” goals of social justice on the other. Those who stuck to their guns were easily portrayed as other-worldly theorists, not to be trusted with the tough business of running a real economy. The casualties of these withdrawals from the real battlefield included, of course, any sense that the left itself had of where it was going or of how the battle was to be won. They fell back on skirmishing, on the odd guerrilla raid, waiting for their opponents to make mistakes, never daring to mount an all-out assault on the enemy’s heartland of self-serving orthodoxy. This absence of a clear sense of strategy and direction provided of course the perfect conditions for dispute and dissension in the ranks – the kind of disintegration that Roy Greenslade now laments. How did all this happen? Left politicians did not work hard enough. They failed to develop a persuasive and credible alternative to “free-market” economics. Many even, in their heart of hearts, accepted the right-wing analysis. The good news is that even this late hour is not too late. 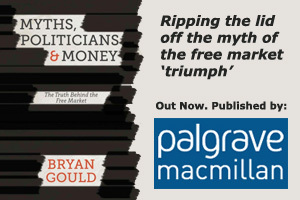 There is a growing body of sensible and informed opinion, until now largely ignored by the left’s supposed leaders, ready to challenge the “free market” orthodoxy, ready to assert that austerity and public spending cuts are literally counter-productive, that high unemployment makes us all poorer, that unaffordable housing widens the inequality gap, that economic efficiency is best secured by making use of everyone’s efforts, that the more unequal an economy the less successful it is, that government should use its power not just to bail out the banks but to fund productive investment and proper jobs in manufacturing and real wealth creation. And because these are sensible policies that are readily explained, the left can get over its fear of departing from the current orthodoxy and can convincingly describe a future around which the whole party can unite. Perhaps there is a future after all. Next: Is All Fair in Love and War – and Politics? Quite simply, I couldn’t agree more. We need to change the conversation and to do that we need to return to our core values with pride and passion. Labour Parties worldwide need a spirited dose of heresy.They always appear duplicitious whenever they express themselves about anything. There is no excuse for an intellectual deficit in ‘left’leadership. There are widely available publications such as your books, Thomas Pickety’s “Capital” and Stiglitz’s books. Rather there it is a lack of able political actors partly because the Party shuts out fresh talent by continually looking inward or drawing from traditional pools of talent. Able people may well find the party politics and parliament boring wastelands.